Underdog start-up company beats the established brands in taste tests. Consumer judging levels the competition. In a market saturated with established brands, it’s a sense of triumph when the underdog wins. Spirits of the USA brought home Best in Class plus 5 medals from this year’s SIP Awards. The coveted “Platinum – Best in Class” award was for Deadman’s Mango Rum. The Spirits International Prestige (SIP) Awards is the only international spirits competition that levels the playing field for established brands and newcomers alike by enlisting consumers as judges. The judges engage in blind tastings by scoring each spirit on Aroma, Taste, and Finish. The judges were chosen to ensure a broad cross section. “We make our selection based on specific demographic info to ensure a true representation of the consumer,” states Navid Firoozi, for the SIP Awards. The awards were presented at the Hyatt Andaz Hotel in San Diego, CA on Thursday, June 10, 2010. The Company’s complete line of premium vodkas, tequilas, rums, gin and non-alcoholic drinks are currently available in Florida and Missouri with Texas and other states coming on line soon. The Company will add bourbon, whiskey plus new rum and vodka flavors later this year. 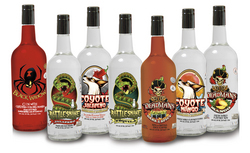 About Spirits of the USA – Spirits of the USA LLC is a privately held company headquartered in Jacksonville, FL. The Company was founded in 2007 by Michael Gerard, a veteran of the hospitality and distributing industry for over 20 years. Spirits of the USA was formed to produce the world’s first and best full line of ultra-premium liquor. All of its products, except tequila, are produced and packaged in the United States with a "craft distillery" approach. The product line is being initially rolled out in key U.S. markets through small regional distributorships. The company hopes to extend its reach to the global market within its first three years. Design Coup Inc. of Atlanta, GA, is handling marketing, design and promotion for the new product line. For distribution opportunities or to learn more, contact Michael Gerard at 866-795-5463. Visit Spirits of the USA on Facebook.